Himera - Himera - Termini Imerese - See Palermo and Western Sicily. The archeological site of ancient Himera (Imera), best known for the remains of its Temple of Victory, are located in a coastal plain at the mouth of the Imera River about eight kilometers east of Termini Imerese off of State Road 113 (SS-113), in the district called Buonfornello. 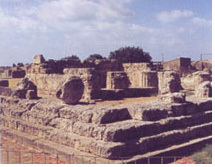 The history of ancient Termini Imerese is really the history of Himera. Though the ruins of this coastal city are not as "complete" as those of Solunto, the ancient Roman city near Bagheria, Himera is worth a visit if you're a serious fan of ancient Greek cities and temples. Though Himera's Doric temple is interesting, it is less spectacular than the temples of Segesta and Agrigento. In fact, it is little more than a foundation, with no standing columns. There are also the remains of two other temples in the same archeological park. Like Caccamo, Himera is worth a stop on the way to Cefalù from Palermo if your schedule allows. Many fragments of Himera's temples, including a series of water spouts sculpted in the form of lions' heads, have been removed and are displayed at Palermo's archeological museum. "Termini Imerese" comes to us from the Latin Thermae Himerenses or "Hot Springs of Himera." Indeed, the remains of arched Roman aqueducts are visible in Termini. Himera (or "Imera") was the name the ancient Greeks gave settlement they founded near present-day Termini. The story of Himera is the only historically noteworthy episode that can be linked to the ancient history of Termini Imerese. Himera was founded around 678 BC (BCE) by Greek colonists from Zancle, modern Messina. Zancle itself had been founded in the previous century by Greek colonists. It is probable that a prehistoric settlement already existed there, populated by Sicanians. Politically, Himera represented the farthest westward expansion of the Greeks along the Sicily's Tyrrhenian coast, constituting a threat to the Carthaginians, who had colonized the western area of Sicily and founded Palermo and Solunto, the latter city being only twenty kilometers distant from Himera. Though Palermo later, of necessity, came under Greek influence, it was never truly a Hellenic city. In 480 BC, the Carthaginians decided to invade the region. Hamilcar, a Carthaginian general who was an ancestor of the famous Hannibal who later fought the Romans, assembled an army said to number thirty thousand men to march upon Himera. The Greeks of Himera sought and received help from the Greeks of Agrigento and Syracuse. The three combined Greek armies literally massacred the Carthaginians, and thus the Carthaginian threat to the Sicilian Greeks was effectively eliminated, at least for the remainder of that century. In 409 BC, Hannibal, grandson of Hamilcar, led a large Carthaginian army against Himera. This time, the Greeks were defeated and Himera was destroyed. It is believed that the Imerians who survived the battle fled to Termini and Caccamo.